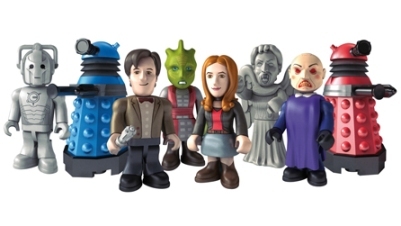 As if one set of Dr Who characters were not enough, the BBC has just announced a new set of Dr Who figurines [^]. The new set features Matt Smith’s Eleventh Doctor, and Karen Gillan as Amy Pond. A Cyberman is again present, as are the new, bigger, more colourful 1970’s kitchen appliance style Daleks. A new addition is the creepy weeping angel. Just remember that anything that portrays an angel gains the abilities of an angel, and will eventually become one!